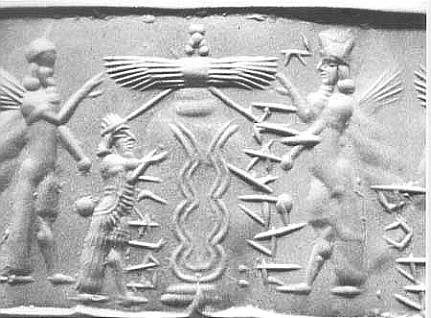 Priests and Priestesses dressed as Bee's to worship the Divine Bee Goddess in Ancient Sumer. Minoan Golden Bee. In Crete the Bee Goddess was worshipped. The Priestesses would wear wings and dance about in worship of the Great Mother. Bees were also sacred in Egypt. Bee Coin from Sicily 700 BCE. Wherever the bloodline families have been, they have carried the teachings of the Bee Goddess, the Divine Feminine is denied by so many, yet strong in the hearts of the TRUE bloodline families. _Bees, like all insects that spin cocoons or weave webs, serve as images of the miraculous interconnectedness of life. The intricate cellular structure that secretes the golden essence of life is an image of the network of invisible nature that relates all things to each other in an ordered harmonious pattern. Perhaps this is the meaning of the tale in which the infant Zeus is fed on honey in Crete, and why honey was the nectar of the gods. Furthermore, the busy bee, following the impulsion of its nature to pollinate the flowers and gather their nectar to be transformed into honey, was an example of the continual activity required of human beings to gather the crops and transform them into food. The queen bee, whom all the others serve during their brief lives, was, in the Neolithic, an epiphany of the Goddess herself. Gold seal ring, c. 1450 BC. From a tomb at Isopata, near Knossos. _For a watchful eye, the relationship between the queen bee and the Goddess and her Priestesses, dressed as bees must have seemed irresistible, and in Minoan Crete 4,000 years later the Goddess and her Priestesses, dressed as bees, are shown dancing together on a golden seal found buried with the dead. In Crete also the bee signified the life that comes from death, as did the scarab in Egypt. Probably for this reason, the gold ring seal was placed in a tomb. Here the bee Goddess, the figure in the centre descending to earth among snakes and lilies, is being worshipped by her Priestesses, who, characteristically, take the same form as she does, all raising their ‘hands’ in the typical gesture of epiphany. Honey was used to embalm and preserve the bodies of the dead. 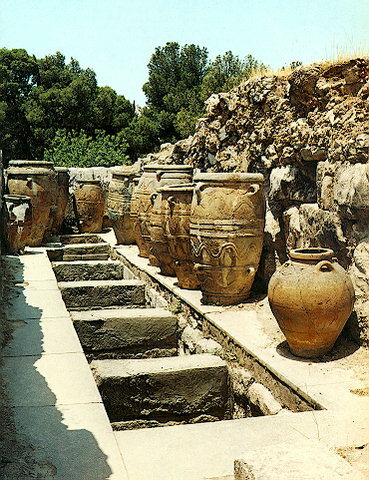 Some of the great jars, or pithoi, found at Knossos were used to store honey. _Honey also played a central part in the New Year rituals of the Minoans. The Cretan New Year began at the summer solstice, when the heat was at its greatest, and 20th July was the day when the great star Sirius rose in conjunction with the Sun, as it did also in Sumeria and Egypt. 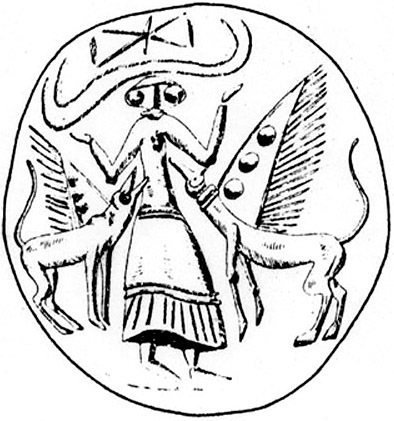 In these two other countries Sirius was explicitly the star of the Goddess (Innana in Sumeria, and Isis in Egypt), and Minoan temple-palaces in Crete were orientated to this star. 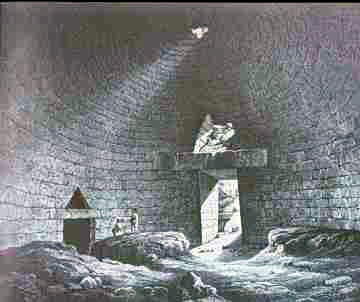 The rising of Sirius ended a 40-day ritual during which honey was gathered from the hives of the bees in the darkness of the caves and the woods. The honey was then fermented into mead and drunk as an intoxicating liquor, accompanying the ecstatic rites that may have celebrated the return of the daughter of the Goddess as the beginning of the new year – as, perhaps in the seal of the double axe. All these rites are present in the classical Greek myths of Dionysos, himself originating in Crete and called the Bull God. A bull was sacrificed with the rising of the star Sirius, and the bees were seen as the resurrected form of the dead bull and also as the souls of the dead. This festival for the rising of Sirius that initiated the New Year was thereby raised to the level of a myth of 'zoe' (indestructible life):the awakening of bees from a dead animal. This intense drama of epiphany suggests that, as well as these connotations, the humming of the bee was actually heard as the voice of the Goddess, the sound of creation. Virgil, for instance, describing the noise of howling and clashing made to attract swarming bees, says: They clash the cymbals of the Great-Mother. Knosis Crete 1500 BCE. The importance of bee-keeping to the Minoans is documented in the Linear A hieroglyphs, where there are already drawings of actual beehives, testifying to a long history probably going back to the Neolithic era. The onyx gem from Knossos shows the Bee Goddess bearing upon her head the bull’s horns with the double axe inside their curve. The dogs – later the dogs of the underworld belonging to Hecate and Artemis – are winged and flying so close to the Goddess that their wings, at first glance, appear as hers. OMPHALOS STONE at Delphi, Greece. _The tombs at Mycenae were shaped as beehives, as was the omphalos at Delphi in Classical Greece, where Apollo ruled with his chief oracular Priestess, the Pythia, who was called the Delphic Bee. There are some Fates sisters born, maidens three of them, adorned with swift wings. Their heads are sprinkled over with white barley meal, while they make their homes under the cliffs of Parnassus. They taught divination far off from me, the art I used to practise round my cattle while still a boy. These sacred bee-maidens with their gift of prophecy, were to be Apollo’s gift to Hermes, the God who alone could lead the souls of the dead out of life and sometimes back again. The etymology of the word ‘fate’ in Greek offers a fascinating example of how the genius of the Minoan vision entered the Greek language, often visibly, as well as informing its stories of Goddesses and Gods. The Greek word for ‘fate’, ‘death’ and ‘Goddess of death’ is e ker (feminine); the word for’heart’ and ‘breast’ is to ker (neuter); while the word for ‘honeycomb’ is to kerion (neuter). The common root ker links the ideas fo the honeycomb, Goddess, death, fate and the human heart, a nexus of meanings that is illumined if we know that the Goddess was once imagined as a bee. Text from The Myth of the Goddess: Evolution of an Image by Anne Baring & Jules Cashford. Birds of the Muses "Bees have an ancient reputation as the bringers of order, and their hives served as models for organizing temples in many Mediterranean cultures. Priestesses at Cybele's temples in Asia Minor, Greece, and Rome were called Melissai or Melissae, the Greek and Latin words for bees. These Priestesses were often prophets or oracles who entered an ecstatic trance enduced by preparations that included ingesting honey. (The Greek word for this state of transfigured consciousness is enthusiasmos -- 'within is a god" -- the root of our word enthusiasm.) Bees, familiars of the Goddess since Catal Huyuk, appear frequently in classical mythology. They are called the "Birds of the Muses" and are attracted to the heavenly fragrances of flowers, from which they make the divine nectar, honey. Honey is antibacterial, and its mildly laxative properties and sweet taste made it a primary ingredient in ancient medicines. It was widely believed to be a source of divine nourishment. In the myths of the ancient world, honey often nourished a divine child raised in secret by a Goddess in the depth of caves. " Quoted from When the Drummers were Women by Layne Redmond. Signs of her worship are evident in the Mediterranean cultures of around 3,000 years ago at the temples of Artemis. She is one of the oldest and most popular aspects of the Divine Feminine. Born on the Greek Island of Delos, Artemis was sister of Apollo and daughter to Zeus and Leto. When she was a young girl, her father, Zeus, asked her what was her dream? She answered that she wished to never have to marry a man and to always be free to roam in the wild forest. Artemis was known as a patron of young virgins, and a powerful protectress of the natural world of fertility. As with other early Goddesses, ceremonies to invoke Artemis were held in groves of trees, at places of special rock outcroppings, at sacred sites along rivers or at quiet springs. Ironically, Artemis's blessings were eventually cultivated at exquisite temple sites constructed throughout the Mediterranean region. Artemis was and is to be known as one of the most powerful mistresses of magic. She's allowing us to feed our imaginations with many possibilities, all of which are symbols of fertility that can suit our needs. 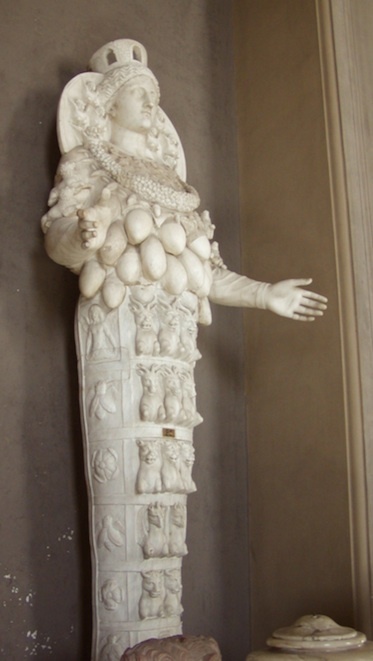 The breast-like objects growing out of Artemis' chest look very much like bees eggs! The Priestesses of historical descendants of the ancient Bee Goddess -- Demeter, Rhea, Cyble -- were called Melissae, the ancient Latin word for bees. The Bible mentions a ruler and prophetess of ancient Israel called Deborah, the "Queen Bee", her Priestesses were known as Deborahs as well. Some say that the Priestesses of the Moon Goddess were called bees because 'it was believed that all honey came from the Moon, the hive whose bees were the stars. Melissa, the Goddess as Queen Bee, taught mortals how to ferment honey into mead. In the Homeric Hymn to Hermes, the Melissai feed on honey and are inspired "to speak the truth". These traditions made the omphalos the place of sacred utterance -- the oracular power associated with the buzzing of bees and the buzzing vibration of life. . . . . The Omphalos is shaped like a bee hive. Paphos, Greece, the site of Aphrodite's tomb, was known as the navel of the Earth. The Greek word for navel -- omphalos -- also refers to the sacred stone found in temples or shrines. Symbolically, the omphalos brought together a number of important spiritual concepts. The heart-seat of the great Earth Mother was the very centre of the navel of the world. The navel cord connects the foetus with outer and inner worlds, and is the source of nourishment until it is time for birth. Similarly, Aphrodite's temple was the place where initiates were nourished and birthed into higher planes of consciousness. Goddess wearing a beehive as a tiara Hacilar, ancient Turkey circa 8000 BCE. This is the origin on the beehive shaped Mitre of the Cohen Priests. ​Queen Bee. 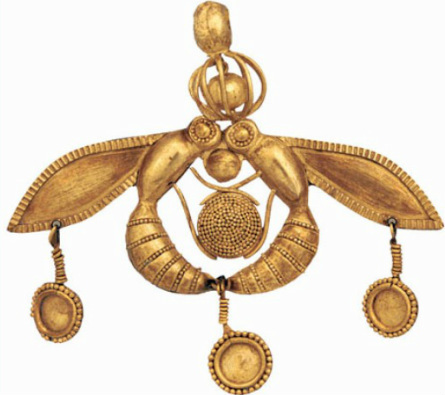 The Anatolian Goddess is often shown wearing a beehive as a tiara, most frequently at Hacilar. This is the introduction of a motif that would flourish in historical times. Of all the insects represented in the ancient world, bees are foremost in ritual and symbolic meaning. The Goddess's tiara announces her status as a queen bee and suggests that she streams with honey, a much-revered substance in ancient times. How disturbing is then that the male Priests wear these items and never revealed the origins to women, and kept it secret to suppress and oppress them! Bees also represent birth, death, and reincarnation. Bees have an acute sense of time. They appear to use their internal circadian clocks in conjunction with the Sun's position in the sky to navigate. Because their time memory is so advanced, they can be trained to appear at certain times of the day for feeding. An individual bee within the hive an communicate the location and richness of a newly discovered food source by dancing and drumming with its wings. The queen bee, deep in the hive, lays up to two thouand eggs a day, but only a few male drone mate with the queen -- and just once, since the sexual act ends in his death. All these properties are echoed in historical rituals and mythologies. As Human BEEings, why have we BEEn denied the truth about the origins of religions? Why has the Divine Feminine been denied us for so long? Do you BEElieve it is about time the truth was known? Why is anyone who brings the truth vilified? Why are all women who come forwards told they are feminazi men haters? FEAR, please don't get angry about what we have been denied, just use the knowledge to enlighten others. Join others who are helping, if you are female become a Priestess and claim back your birth right. If you are male don't be afraid of what you will lose with this truth, be happy about what harmony we can all gain from this knowledge and become a Priest yourself. All it takes for ignorance, creed and corruption to continue is for good Beeings to do nothing. Bee the change you want to see. For more information like this see Secrets of the Serpent Bloodline. 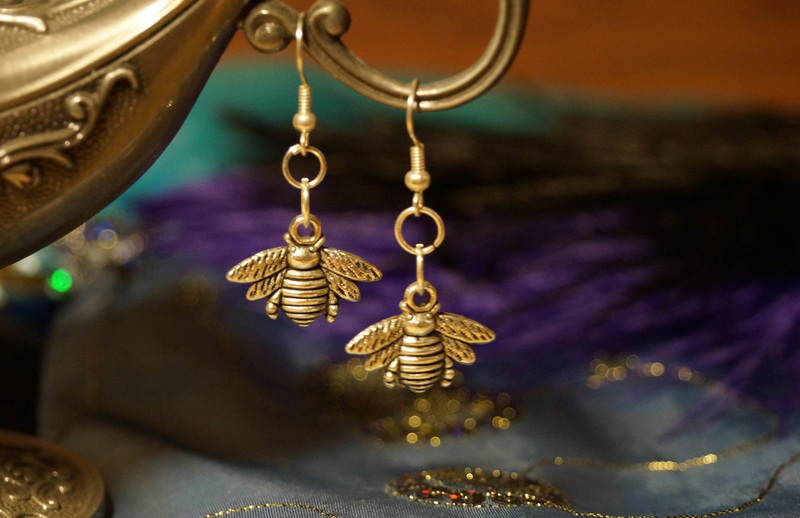 Beautiful Bee Goddess Earrings - Get Yours Now!